Our slip and fall attorneys in Boston understand the importance of establishing a duty of care is owed in a negligence lawsuit. In Burns v. City of Centralia, a case from the Illinois Supreme Court, plaintiff was injured when she tripped and fell on uneven sidewalk. Plaintiff drove to an eye clinic for an examination. When she arrived at the clinic location, she chose to park on the street, rather thank parking in the clinic parking lot. She had done this on nine prior visits to the eye clinic. While walking from her car to the clinic, plaintiff stubbed her toe on the uneven sidewalk. After stubbing her toe, she tripped and fell to the ground, injuring her arm, knee, and leg. According to court records, plaintiff saw the sidewalk defect and had been aware of it from her visits. There was testimony that there was no way you could miss this defect in the sidewalk. During her walk to the clinic, she was focused on the door and the steps leading up to the door. The city had been notified of the uneven sidewalk prior to the accident. The reason the sidewalk was uneven was because the roots from a 100-year-old tree was lifting the pavement. The city refused to remove the tree roots and fix the sidewalk because of the historical significance of the tree. Years before the accident, store employees contacted city officials a second time about the tree, reporting that someone and tripped over the roots and was injured. The accident in this case occurred approximately three years after complaints from store employees, and, since those complaints, no action had been taken to make the sidewalk level. Plaintiff sued the city on grounds that they had failed inspect the sidewalk, and failed to make the sidewalk safe from a foreseeable injury. Defendant moved for summary judgment requesting that the case be dismissed. Basis for the dismissal was that the defect was both open and obvious, and that the city had no duty to warn persons walking on the sidewalk, because it was plain to see. Plaintiff, through counsel, filed an opposition to the motion for summary judgment, asserting that she was distracted at the time of the accident, and, therefore, she was exempt from being required to take care to avoid the obvious defect, under what is known as the distraction doctrine. The trial court granted the defendant’s motion for summary judgment, and the case was dismissed. 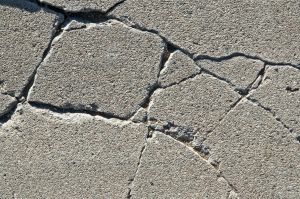 Plaintiff filed an appeal to this dismissal, and the intermediary court concluded that the city had a duty to maintain the sidewalk and reversed the dismissal of the case by the trial court. Defendant appealed the case to the highest court in the state, which ultimately reversed the court of appeals and affirmed the trial’s courts ruling to grant defendant’s motion for summary judgment. Basis for affirming the trial court’s decision was that the gaps in the sidewalk were open and obvious, and the city had no duty to warn plaintiff of these conditions. The court held that the distraction exception argued by plaintiff did not apply for the simple reason that plaintiff was not distracted. She was walking toward the clinic looking at the front door.